The kitchen chamber or back room, 2002. The family referred to the northeast room as the kitchen chamber or back room. A secondary bed chamber, it would have been used by younger members of the Wadsworth and Longfellow families. Readily accessible to the kitchen by way of the rear stairs, the room was warmed by heat from the cooking hearth. The Longfellow children reportedly sat at the top of the stairs on Thanksgiving morning, inhaling "delightful odors." Henry Wadsworth Longfellow II, the poet's nephew, represents another generation who may have used this room. After Hen's parents, Stephen and Marianne Preble Longfellow, were divorced in 1850 and Stephen died in 1851, Hen's Aunt Anne Longfellow Pierce became his guardian. Hen was the source of constant comment in family correspondence and constant consternation for Anne and his great-aunt Lucia Wadsworth. The pine child's desk, worn and scribbled with graffiti, dates to the school years of the Longfellow children. Eighteenth-century French prints of children and maps of places near and far are a few of the many works on paper from the Longfellow family collection. Surveyor Alexander W. Longfellow owned many maps that were given to the house. 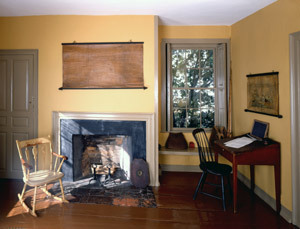 The ochre walls, gray green woodwork, and brown floor are all documented by paint analysis.